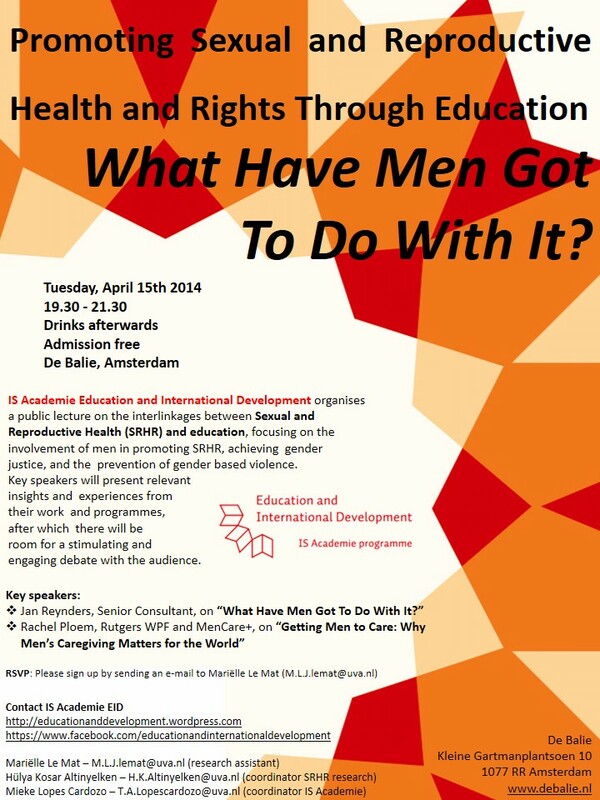 April 15, Promoting Sexual and Reproductive Health and Rights Through Education – What have men got to do with it? The IS Academie Education and International Development organised a public lecture on the 15th of April from 19.30 onwards at De Balie in Amsterdam. During this public lecture, Jan Reynders (senior consultant) and Rachel Ploem (Rutgers WPF and MenCare+) discussed the interlinkages between Sexual and Reproductive Health and Rights and Education, focusing on the involvement of men in promoting SRHR, achieving gender justice, and the prevention of gender based violence. Their lectures were followed by insights from our discussant Lambert Grijns (Special Ambassador SRHR&HIV/AIDS at the Ministry of Foreign Affairs), and debate with the audience. For video of the lectures of Jan Reynders and Rachel Ploem, click here. Edith van Ewijk, researcher at NCDO, has written a report on the evening (in Dutch), published at One World/Love. Please follow this link for the full report. For more information, please contact Mariëlle Le Mat, research assistant of the IS Academie EID, M.L.J.leMat@uva.nl.